The freezer is the perfect piece of kitchen equipment for making the most of special offers in the supermarket, making quick tasty meals and making sure you do not waste any leftovers. Many people think that they do not have enough time after work to cook a decent meal for their family, or even just for themselves, but if you use your freezer effectively you will realise that there is no excuses! 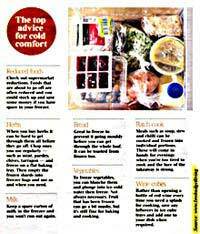 All too often people think the freezer is just there for storing ice cubes, ice cream and the odd bottle of vodka. While these three are certainly good freezer standbys (! ), they are certainly not the extent of your freezers potential. This gloriously old-fashioned practice of batch cooking is slowly coming back into fashion, and for good reason. Batch cooking is when you set aside some time, often a Sunday afternoon or a day off, to make a load of meals for your freezer that will be greatly appreciated when time is tight. Batch cooking is particularly well suited to dishes that take too long to cook in your normal half hour after work dash to get something tasty and nutritious on the table. Food such as casseroles, stews and pies freeze especially well and are often easier tastier than when they were first made. You could think about making a big pot of minced beef and onions and then, when cooled, freezing it into portion sizes that suit your lifestyle. It can then be quickly turned into spaghetti bolognese, lasagne, minced beef and dumplings or with mash. This is another housewives favourite that is gaining popularity as people realise they can knock up a quick, healthy supper far more effectively that going to the local takeaway – and for far less money. Having a good stash of Tupperware makes storing prepared food, leftovers and ingredients in your freezer far easier. You can stack them more easily, which not only saves valuable freezer space, but also makes your freezer run more effectively as a full freezer is more economical. As well as Tupperware, using strong, sealable plastic bags (often called Freezer Bags or Zip Lock bags in the supermarket). These are especially good for freezing soups and other liquids. You can place the empty bag in a Tupperware, fill it with your liquid, seal it and freeze it still in the box. When it is frozen solid, take it out of the box – it will stack more easily in your freeze and save space. You may think that you could never forget what that sweet potato soup looks like, or what your beef in beer is, but it is very easy! Get into the habit of labelling everything you put in the freezer and then you won’t end up defrosting what you think is beetroot soup only to find it is a blackberry pie filling! It is also worth putting the portion size of the food on the label too – such as ‘One Portion Chicken Casserole’ with the date. Some people also like to label it with cooking instructions if you have various family members to cater for in the kitchen at different times.